Prabhas Raju Uppalapti is a popular Telugu actor, smart, good looking and successful. He is apparently still single although he is well into his thirties. His fans are curious to know why. His hand reading can shed a light on this. Prabhas’s hands are slightly large, with long fingers and a long palm. His fingers are quite flexible, and the thumb is slender, supple, a good length with balanced phalange length. 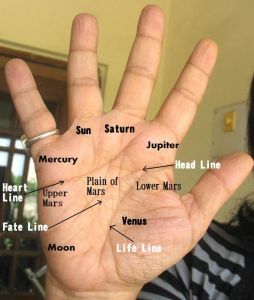 The index (Jupiter) finger is a little bent, and the little (Mercury) finger a little short. Nails are a little small too. While most of the fingertips are rounded, the ring (Apollo) fingertip is spatulate. The lines on his hand are well-etched, the Headline forming a nice curve, and the Heartline on the straighter side, and not long enough to reach the Jupiter mount. of some difficulty in evaluating people accurately. Check out a hand photo of his here or here. It’s also clear that Prabhas is a sensitive person, quite vulnerable. He is likely to live fairly deeply in the world of his own emotions and will not expose his true self readily. This way he feels safe, protected. He is not an easy person to understand because there is likely to be some emotional suppression. He may not readily share his deepest feelings, and hide some feelings even from himself. Ironically, feelings are an important part of his decision-making process. Structure, organisation, and detail is what will make him feel more secure. His perceptions are a little subjective, and he tends to look at people and at the world depending on how he is feeling and thinking at that particular time. Whatever the reason, real intimacy is not easy for him because he may not be able to trust even those who deserve his trust. It can affect communication, more so intimate communication. At heart, he would be cautious and it is important that he learn to trust others. Once trust is earned, he can be very loyal, loving and steadfast in his affections. The kind of person who he is best suited for is someone equally vulnerable because she will understand him the best. He could also get along well with someone who is practical and down to earth because such a person could give him a sense of security. His hand shows a vivid imagination and creative and dramatic talent, with a unique flair and style. His imagination is such that he is likely to introspect, at times more than necessary, and this can cause unnecessary soul searching and gloomy thoughts. And when it comes to ambitions and life in general, the journey is important. He does not see life as getting to a fixed goal. There is flexibility in this regard, and at heart he is non-materialistic. He may or may not know it, but trying hard to shelter himself from getting emotionally hurt will be counterproductive. That said, he is not the kind of person who will be happy spending his life alone. Prabhas (full name Prabhas Raju Uppalapati) is an Indian Telugu film actor and the nephew of Telugu actor Uppalapati Krishnam Raju. You might also like Rajnikanth's Handreading or Tamil star Kamal Hassan. Or other Actors from Bollywood or Hollywood. His friends say that he has a big heart and is caring about his co stars and people around him ...Does his hands also indicate the same? MyRblog, Yes, his hands show that he is a caring person. Is able to love very deeply too. Not the fickle type. Prabhas is like a walking and talking example of a Virgo man. I have a photograph of him using a desk, sitting with a computer and a mouse. This shows that he is right handed. To get hand photos of lesser known actors is very difficult on the web. However if I find any, I shall certainly do this reading. I need at least a dozen photos of his hands from different angles.